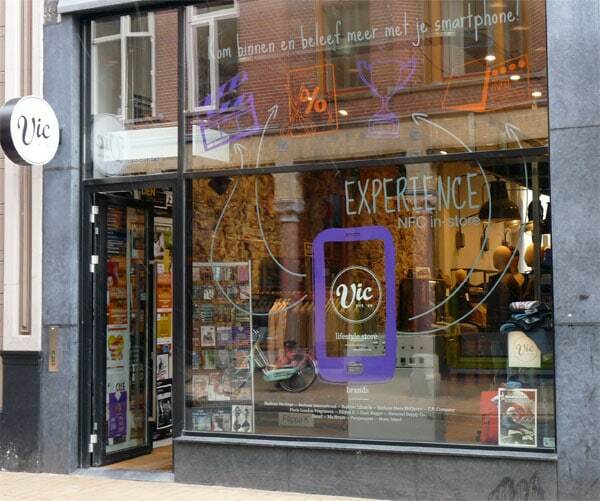 High-end fashion retailer Vic is piloting an in-store NFC experience at its shop in Groningen, the Netherlands, allowing customers to access product information, vouchers and promotional videos using their mobile phone. The project, which is managed by tag platform provider SenseMe, uses NFC tags and QR codes located around the store and on individual product items. When a customer reads a tag they can be provided with a promotional video, sent to a brand’s website to view detailed product information, or offered a coupon or voucher. “It is a very cool system, especially for some brands who have a lot of information on their websites about certain products,” store manager Jouke De Jong told NFC World. “We use tablet devices in-store to demonstrate to customers how the system works, and we have found that the NFC tags are more popular than the QR codes because they are very simple to use. “It is definitely something we hope to keep in our store going forward into the future; it is our way of connecting our online and offline worlds”. SensMe’s Dennis Bolhuis told NFC World: “We are the first company in Holland to promote NFC in the retail store. Our country has been quite slow in accepting the technology and the retail market is going very slow at the moment. “It is increasingly difficult for retailers to promote their product, which is why we are stimulating mobile use in-store. The NFC tags are a way of giving something extra to the client and it is a great opportunity for SenseMe to promote NFC in the Vic store. “It is currently a small retailer, so we are able to learn a lot more about customers, how they use their phone and their shopping behaviours. Over here, customers are a little bit lazy. They want more information about products but they don’t want to use a lot of energy to get it.